My daughter loves Sesame Street. To her, Elmo is the star...and the little red monster rules her small world. It used to be I would read her any book I chose before putting her to bed...now she only wants me to read books with...uhhh...that little red monster. 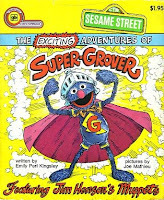 My favorite character in Sesame Street is Grover...actually he's the antithesis of Grover, that is...Super Grover. In the 70's, 'ol Super Grover being as popular as today's Elmo... I remember acting-out Super Grover skits during the winter months in NorthEast Ohio (back then, there were a lot of them!). I had long forgotten about that furry blue monster until being reacquainted through my daughters' eyes. Amazing that a puppet can be that enduring for this long. Recently Gatorade changed their logo. Yes, I get it, with the world becoming smaller via handheld devices, they want a one word logo that acts as a symbol so it can be easily identified on those tiny little screens that are creeping into are daily lives. Yes, the concept has merit...however I think they could have served themselves better by just their bolt of lightning, and leaving the 'G' out of the logo. So until Gatorade redesigns that logo, Super Grover is going to live with all of us not only on Sesame Street, but in his reincarnated state as a sports drink, because every time I see that logo I think of that silly blue monster with his shiny Knight helmet. Maybe I'm not the only one who makes this connection, and the marketing folks at Gatorade are Super Grover fans, and maybe that's a good thing. Maybe Jim Henson is smiling. Only you could come up with that connection. You said that there used to be "a lot of them" in East Ohio back in the 70's.